The English language is rich and beautiful, and all parts of speech are aimed to make this language better, brighter and full of meaning. An adverb is a very important part of English speech: it is used to modify verbs, adjectives, or other adverbs. But many writers, linguists and researchers believe we should be very (not very, but VERY and very) careful when it comes to adverbs use. And the following infographic can help. 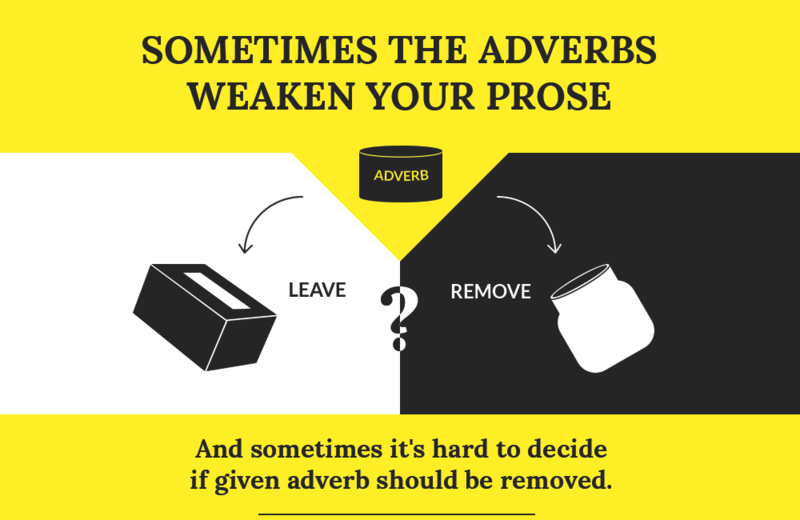 Created by Adverbless, a site that was developed to help writers confirm they were using adverbs correctly, this infographic asks ten questions a writer can use to diagnose whether they're using the right adverb, and using it correctly. “sweared”? Shouldn’t that be “swore”? Somehow there are numerous problems with the grammar in this grammatical advice. I’m embarrassed to say i didn’t see the errors. I should have read this critically, and not for my own enjoyment.